"When Keely obtained continuity of motion (for a time) in his engine he thought that his last difficulty had been overcome: but, up to the present time, he has not succeeded in governing its speed nor in controlling reversions. He has, however, again reduced in size the instrument with which he produces the force. 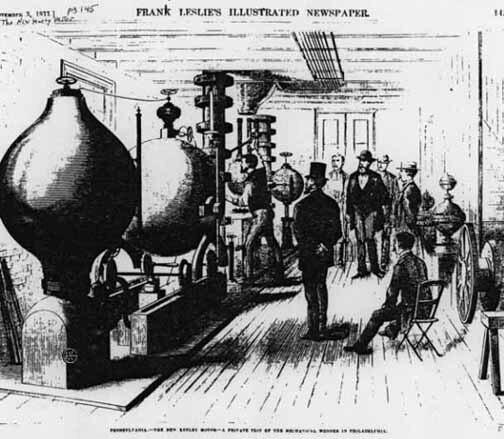 From 1882 to 1884 the "Generator" was a structure six feet long and correspondingly wide and high; but, failing in his attempt to make an automatic arrangement upon which its usefulness in mechanics depended, Keely found a new standard for research in an experiment often made by himself, but never before successful, which resulted in the production of a machine in 1885 which he named a "Liberator" - not so large as a lady's small round work-table. Continuing his labour of evolution Keely within one year made such astonishing progress, from experiments with this beautiful piece of vibratory mechanism, as to combine the production of the power, and the operation of his cannon, his engine and his disintegrator in a machine no larger than a dinner plate, and only three or four inches in thickness. This instrument was completed in 1886, up to which time his experiments had been conducted upon a principle of sympathetic vibration, for the purpose of liberating a vaporous or etheric product. His later experiments have been confined to another modification of vibratory sympathy; and the size of the instrument used now, '88, for the same purpose is no larger than an old-fashioned silver watch, such as we see in Museum collection. The raising of a lever with an apparent uplifting expansive force of between 20,000 and 30,000 pounds to the square inch, the running of the engine, the firing of the cannon, are conducted without one ounce of pressure in any part of the apparatus, and without the production or presence of what has been known as Keely's ether. 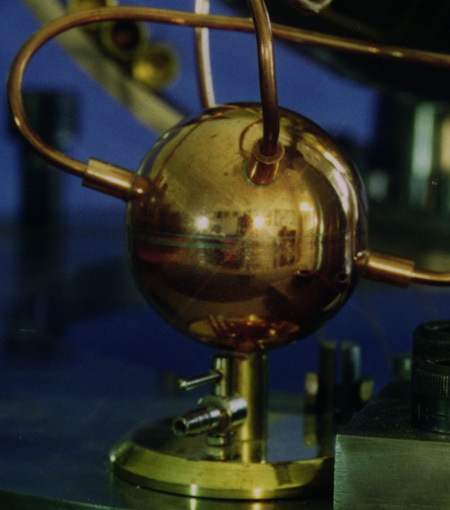 The force is now transmitted along a wire (of platinum and silver), and when the lever is lowered there is no exhaustion, into the atmosphere of the room, of any up-lifting vapour, as was always the case when the ether was used in this experiment; nor is there any vapour impinging upon the piston under the lever to raise it. "To move suddenly a square inch of air at the velocity of his vibratory circuit, on full line of graduation and at a vibration only of 2,750,000 per second, would require a force at least of twenty-five times that of gunpowder, and at 21,000 lbs. per sq. inch it would be 525,000 lbs. per square inch. The finer the substance the greater the power and velocity under such vibrations. "The vapor from the liberator, registered at 20,000 lbs. per square inch has a range of atomic motion of 1333 1/3 the diameter of the atmospheric molecule with constant rotary vibratory action. At 10,000 lbs., 666 2/3, at 5,000, 333 1/3, at 2500, 166 2/3, at 1250, 83 1/3, at 625, 41 2/3. The higher the range of atomic motion the greater its tenuity and pressure. The very evolution on the negative shows a vacuum of a much higher order than was ever produced before confounding all theory to analyze. The highest vacuum known is 17.999999, or not quite 30 inches, but Keely produced etheric vacuums repeatedly of 50 to 57 inches ranging down to 30 inches or 57 lbs. All operations of nature have for their sensitizing centers of introductory action, triple vacuum evolutions. These evolutions are centered in atomic triple revolutions, highly radiophonic in their character and thoroughly independent of all outside forces in their spheres of action. No conceivable power, however great, can break up their independent centers. These triple centers are the foundation of the universe, and mathematically considered, the respective and relative motion of these atomic triplets, gravitating to and revolving around each other, is about one and one-third of their circumference. The problem of this action, when analyzed mathematically, (taking it as the quadrature of the circle) would baffle mathematical science to bring it to a numerical equation. Every revolving body is impressed by nature with certain laws making it susceptible of the operation of force, which being applied, impels motion. These bodies never can approach nearer than a certain limit, nor farther than a certain point. They are, at some mean point, made perfectly equal, and may therefore be considered as one force and as one element. It matters not that other and disturbing forces exist outside or inside the space these bodies revolve in, because if this force must be considered as acting uniformly, applying itself to each of these bodies in a way to produce a perfect equation on all, it is as if this outside force were nonexisting. "My right hand and arm were ... severely strained, but I have not been idle ... have been setting up a key to explain vibratory rotation. I have a plan for a device attached to the Liberator to show when the neutral center is free from its intensification while operating. In this way the dangerous influences will be avoided which present themselves on the extension of the vibratory waves that operate the gun. All introductory details of the present engine are as perfect as is possible for the first lead. 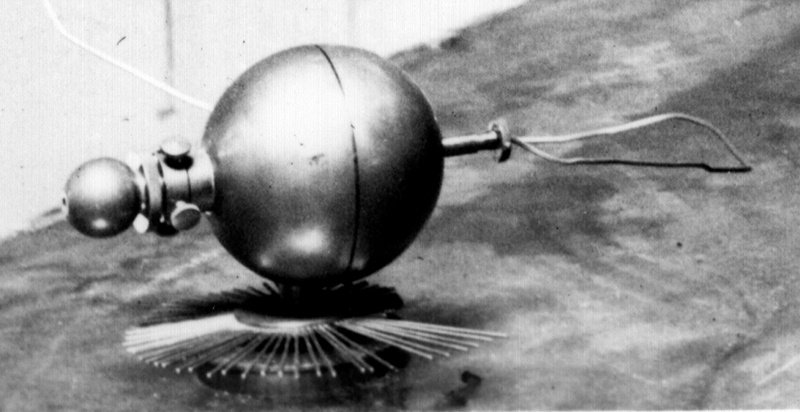 It is in the form of a sphere, about thirty inches in diameter and weighs 800 lbs. Yesterday saw the pure, positive action of my new Liberator. Mr. Collier and his brother George were present and witnessed thirty expulsions, made by myself after which I had them produce the vapor, by imitating my manipulations which they were unable to do with the old generator. The last three weeks ... I have suffered from accidents, disappointments, etc. ... all things seemed to go wrong." Under another date he writes "...Am now preparing new features that are necessary as adjuncts to denote the true condition as regards safety in my different vibratory operations ... I had an accident to one of my registers this morning. It burst with a tremendous report, shaking things up in a lively way but no other damage was done beyond that to the register." "August 5th. "I have met with an accident to the Liberator. 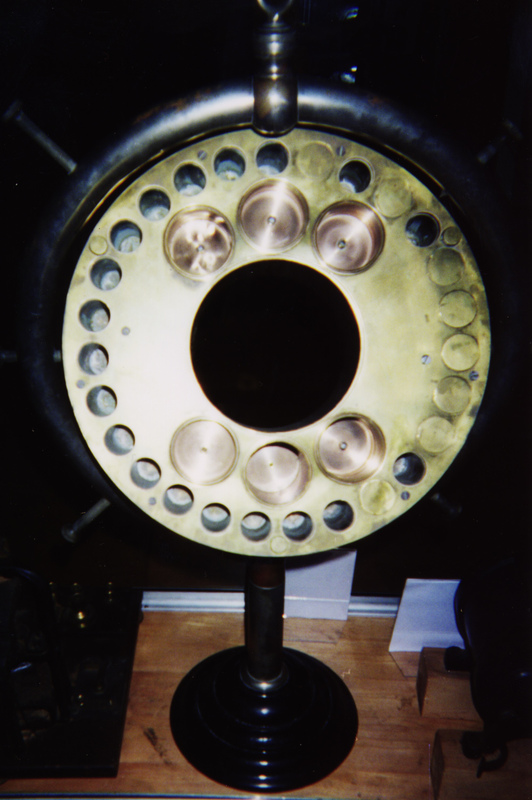 I was experimenting on the third order of intensification, when the rotation on the circuit was thrown down in the compound resonating chamber, which by the instantaneous multiplication of the volume induced thereby, caused an explosion bursting the metal casing which enclosed the forty resonators, completely dismantling the Liberator. The shock took my senses from me for a few moments, but I was not even scratched this time. A part of the wall was torn away and resonators and vibrators were thrown all over the room. The neighborhood was quite lively but I quieted all fears by telling them ... I was only experimenting. I allowed everything to remain until Dr. Woods and Mr. Collier had seen the effect of the explosion. "The orders of intensification for accelerating dissociation would not be understood by any explanations that could be made, if unaccompanied by the demonstrations witnessed by the late Prof. Leidy, Dr. Brinton and others. "When the ether flows from the tube, its negative center presents molecular subdivision, carrying interstitially (or between its molecules) the lowest order of liberated ozone. This is the first order of ozone and is wonderfully refreshing and vitalizing to those who breathe it. The second order, or atomic separation, releases a much higher grade of ozone in fact, too pure for inhalation, as it produces insensibility. The third order, or etheric, is the one that has been (though attended with much danger to the operator) utilized by Keely in his carbon register to produce the circuit of high vibration that breaks up the molecular magnetism which is recognized as cohesion. The acceleration of these orders is governed by the introductory impulse on a certain combination of vibratory chords, arranged for this purpose in the instrument, with which Keely dissociates the elements of water, and which he calls a Liberator. "In molecular dissociation one fork of 620 is used, setting the chords on the first octave. "In atomic separation, two forks one of 620 and one of 630 per second, setting the chords on the second octave. "In the etheric three forks one of 620, one of 630 and one of 12,000, setting the chords on the third octave. "December 17, 1885. "The setting up of the circles for computing the different lines of etheric chords, in setting the vibratory conditions for continuity requires costly study. I feel convinced that ... perfect solution ... will follow when this ... has been completed ... I find my chief trouble in chording up the masses of the different parts composing the negative centers. The negative center is included in the one-third volume of shell or sphere, starting from the neutral axis or point of suspension. This point of suspension only becomes perfect when the rotation is established on the sphere. One hundred revolutions per minute is all the velocity required to neutralize the gravity of the central third with the velocity of the vibratory circuit at one hundred thousand per second ... The month of January (1886) ought to find all completed ready for sympathetic graduation..."